Twenty-nine Sheridan Junior High School students recently earned their place in the Region 3 East All-Region choir, with 10 of those students placing in the top ten chairs. The competition was held Saturday, Oct. 15 in White Hall. Thirty-nine SJHS students competed against more than 700 students from area schools for their spot in the choir. 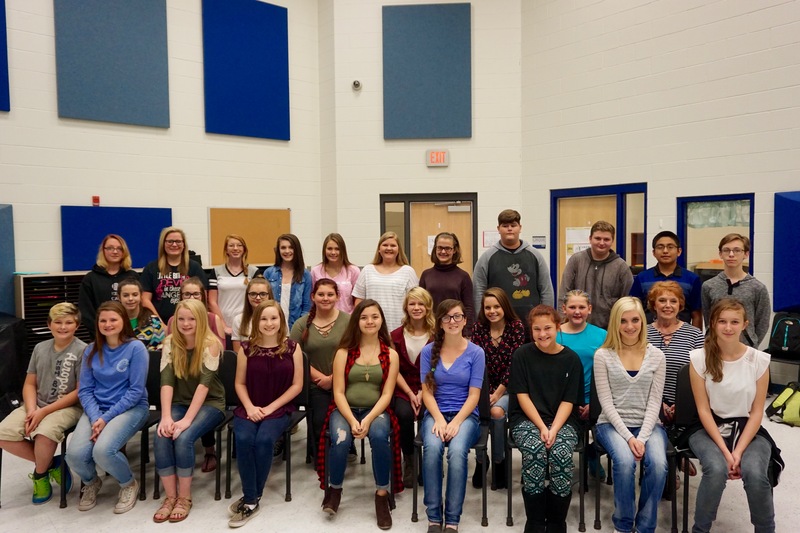 With 29 students participating, SJHS will be well represented at the All-Region concerts, according to SJHS Choir Director Karen Robinson. These concerts will take place on Nov. 11 at First Baptist Church in Benton. Grace Vance (Chair 1, Soprano II); Annslee Clay (Chair 1, Soprano II); Jeri Holland (Chair 2, Alto I); Austin Cox (Chair 2, Tenor II); Jack Clay (Chair 2, Bass I); Lexi Hardin (Chair 5, Soprano I); Carianne Kelly (Chair 6, Sporano II); Lexi Peck (Chair 7, Soprano II); Danielle Crutchfield (Chair 9, Alto I); Samantha Lamont (Chair 10, Soprano II); Evie Ramsey; Ava Morgan; Amber Morton; Logan Cox; Grace Crawford; Hadley Stanage; Salvador Quero; Olivia Hicks; Haylea Harris; Jaden Brown; Michelle Tribble; Emma Childers; Chloe Swiger; Elizabeth Davis; Amber Sutton; Analise McKenzie; Aurora Ingram; Karli Lunsford; and Tristen Ward.